A concise desktop guide that provides task-by-task guidance on the substantive law of negligence and procedure in New York State. LexisNexis® AnswerGuide® New York Negligence is a practical and concise guide focusing on the key legal and procedural issues that arise in six of the major classes of cases handled by the New York personal injury practitioner: Motor Vehicle Accidents, Premises Liability, Construction Accidents, Products Liability, Governmental Liability and Medical Malpractice. 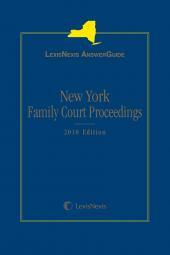 In addition, this portable, one-volume title is published annually and offers valuable practical insights developed by a seasoned trial lawyer and negligence practitioner into the nuances of negligence practice in New York. LexisNexis® AnswerGuide® New York Negligence includes over 40 detailed, task-oriented checklists and more than 200 practice pointers (Warning, Strategic Point, Exception, Timing) to help ensure best practices and the avoidance of potential practice pitfalls. 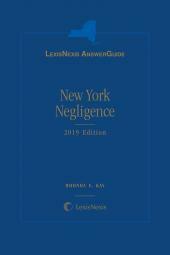 In addition to providing quick answers, LexisNexis® AnswerGuide® New York Negligence provides numerous cross-references to in-depth discussion in Warren’s Negligence in the New York Courts, current cases and related coverage. The cross-references in print make finding related information online easier and faster. Rhonda E. Kay, was a graduate of the State University of New York at Binghamton (1985) and St. John's University Law School (1990). She was a Senior Court Attorney in the Appellate Division, Second Department, before she joined the law firm of Gair, Gair, Conason, Steigman & Mackauf in New York City in 1992. A valued partner known as a "law person," she prepared and argued appeals in all four departments of the Appellate Division, as well as the state Court of Appeals. 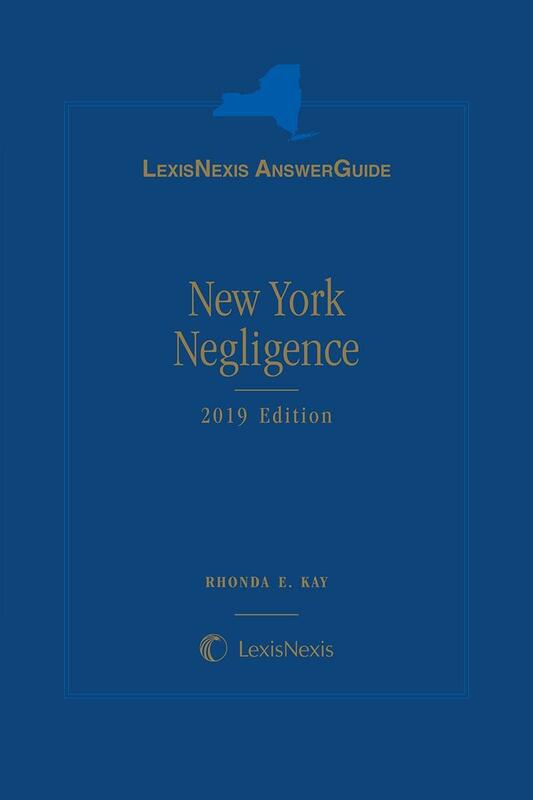 In 2005, Ms. Kay was appointed a member of the Board of Editors for Warren's Negligence in the New York Courts, 2nd Edition (LexisNexis), and in 2006 she authored this publication, LexisNexis AnswerGuide: New York Negligence. Ms. Kay had written course materials for various bar association seminars, including the prestigious Decisions seminar, which advises attorneys throughout New York State as to recent changes and developments in the law. She also co-authored a chapter in a products liability treatise and lectured at continuing legal education programs sponsored by the New York State Bar Association and the New York State Trial Lawyers Institute. Ms. Kay's many professional affiliations included memberships in the New York State Bar Association; the New York State Trial Lawyers Institute; and the New York County Lawyers Association, where she served as an officer of the Appellate Advocacy Committee. Since Ms. Kay’s death in 2012, this publication has been updated annually by colleagues she trusted with her work and for whom this updating is a tribute to Ms. Kay's leadership, scholarship and devotion to this prominent work that proudly continues to bear her name.